If you begin to see a slight increase in surfboards on cars heading towards the beach after 3:00 p.m. on a weekday, and it’s sunny, this indicates a storm is approaching and is about three days away. This first group of surfers is mostly teenagers who waited till after school to check out the surf. It also may include some surfing dads who took off work early to drive their kids to the beach. They will be largely disappointed. 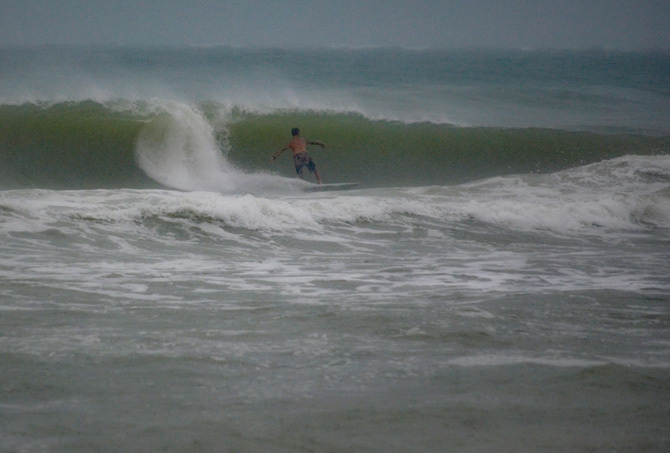 A storm must be much closer to the Tampa area to stir up enough swell to make good surf. This storm may be just West of Cuba and even just approaching the Florida Keys. There’s really no need for alarm at this point. The storm may go in almost any direction, North or West, or it may simply dissipate. Cars heading towards the beach with surfboards after 5:00 p.m. indicates that a storm is about 2 to 3 days away. This indicator may also come with a cloudy sky and an increase in wind. These are surfers who know it’s not good enough to play hooky from work but, “just in case” they don’t want to miss if surf’s up just a little. This is a middle age crowd of experienced surfers. Usually driving newer model, mid-sized pick up trucks with the windows down. This storm has entered the Gulf of Mexico and is about 300 miles away. We still don’t know which direction it’s heading but it’s probably growing stronger. You might start to think about you carpool delays two days from now. If you see surfboards heading towards the beach in the wee hours of the morning, before 8 a.m., this is surfers hoping to catch a few waves before work. The storm is about two days away. The rain may begin and may be constant for a large part of the day. This storm is in the same longitude as Naples, FL. If you see surfboards on cars heading away from the beach and it’s night, they had a great session and couldn’t drag themselves out of the water. The storm will arrive, or be at it’s nearest point, within the next four to six hours. This storm is parallel with Sanibel Island, FL or Venice Beach, FL. You may sleep through this storm but in the morning you can expect the roads to be saturated and tree branches to be down. When all they landscapers in town are seen heading towards the beach, look closely in their trailers. Chances are you will see a surfboard next to their riding lawnmower. This means the first large band of rain has passed, the wind has calmed down and the swell is up. I’ve surfed for over 30 years and still race to the beach when a storm approaches.